TypeKit is a Web-based typography service and it making the web more beautiful, readable, and fast. It offers subscriptions to those who want to use sophisticated fonts in their websites with new abilities in CSS (Cascading Style Sheets). We have used TypeKit in a large number of websites with great success. TypeKit is a great way to add a fresh new look to a sie at little or no expense. It is easy to set up and easy to manage. "Typography is a fundamental design element and something that designers want to be more creative with on websites - especially as these websites now need to be viewed on mobile devices. Working closely with type foundries, the Typekit team has delivered an outstanding service, empowering designers to present the power of the printed word in new ways - online and on devices"
Adobe is among those that distributes its fonts in this way. 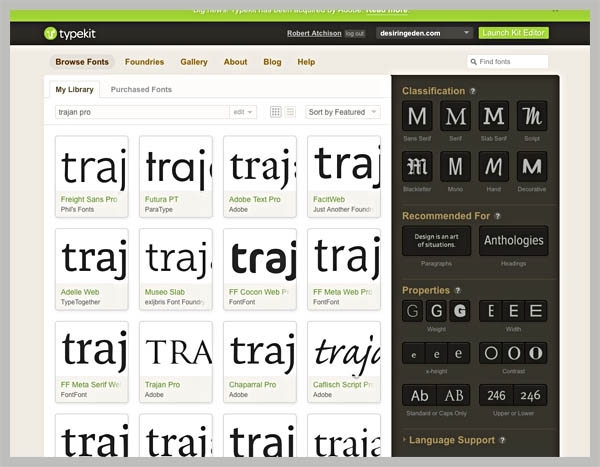 TypeKit already boasts 250,000 customers including such big websites like Vanity Fair, Condé Nast and The New York Times. Subscriptions to fonts cost more from TypeKit based on the number of page views, but for the vast majority of the sites the cost is reasonable - around $25 per year for most sites. Adobe already licenses fonts to those who would use them in magazines and the like. CSS and the related WOFF (Web Open Font Format) technology distribute digital fonts for rendering in a browser, an approach that can save download times and improve flexibility for display on everything from smartphones to big-screen TVs when compared to baking words into graphical PNG or JPEG images. As a designer I have two complaints about TypeKit. First, to create Photoshop screenshots of website pages you have to have the TypeKit fonts installed on your computer. Many of the fonts are very expensive - $399 - for a single font family. No one wants to spend that kind of money on a font you aren't sure you are going to use. Some of the fonts - like Fertigo - are free on the web, but you have to hunt for them. TypeKit has tools that enable you to see how your selected font will look in different sizes and on different browsers, but these tools are no substitute for webpage mock-ups. My second beef is the lack of creative new fonts. There are a lot of fonts on TypeKit but 90% are boring fonts we have seen before. Too many fonts are similar. It can be time-consuming to go through them all and this can be annoying when many of the fonts are tired and not worth the effort. I hope Adobe will be adding more interesting and innovative fonts soon. We use TypeKit's Trajan Pro and Angie on this website - Trajan Pro for the headlines and Angie for text. I especially like FertigoPro and Sweater School for as cool, fun and fresh fonts for modern websites. Angie is similar and all of them are easy to read. If you want to implement TypeKit in your website or want to learn more about wht TypeKit can do for you, give us call at 512 469-7454. Below is a screen shot from TypeKit.